theweathergroup_U presents a final screening/event on the last day of the Biennale. 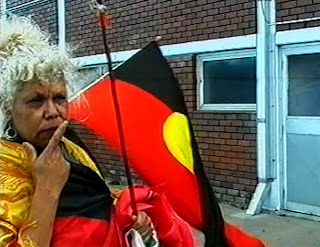 "Fire of the Island" follows Isabell Coe, Robert Corowa and co. as they establish the Sacred Fire and move the Aboriginal Tent Embassy to Cockatoo Island after the Sydney Olympics, 2000. Robert Corowa and film maker G K Young will present the documentary. Percussionist extraordinaire, Louis Burdett will perform a live score. Contaminated waste in Sydney Harbour – high levels of toxic pollution! The Aboriginal Tent Embassy has a mandate, as custodians of the land and the people, to care for Cockatoo Island. Over a century of industrial and maritime activity has seriously contaminated the Island. It contains eight known underground storage tanks, two cyanide waste tanks and numerous pits and sumps. Ground water on the Island has cadmium, copper, mercury, nickel, lead and zinc. The Aboriginal Tent Embassy went there in November 2000 to heal the Island. Is there any way that i can get a copy of this documentary these days?